Lori Durant doesn’t play video games. But when the middle school literature teacher at Duluth’s Marshall School learned that other educators were using a popular game called Minecraft in their curricula, she was interested. And when she heard that a curriculum had been developed combining the video game with Lois Lowry’s beloved book “The Giver,” Durant was all in. “This was just an incredible opportunity,” she said. On Friday, that opportunity reached its final chapter. 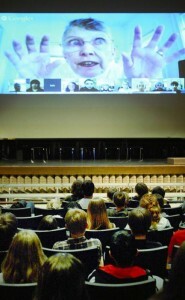 Marshall’s eighth-graders, along with a few seventh-graders, piled into Fregeau Auditorium at noon, where they were connected in a webinar with other students in other schools, a scholar in Alaska, and Lowry, speaking from her home in Maine. In a separate conference room in the school’s office complex, eighth-grader Gabriel Ehlers-Nelson sat alone facing a laptop, headphones covering his ears. More than 20 schools participated in the event, Durant said. But Marshall was one of only six selected to have a student involved directly in the “hangout” with Lowry. The school was chosen, Durant said, because it was among those whose students rose to the top in the view of Lee Graham, the assistant professor at the University of Alaska-Southeast who developed the “Givercraft” project. Graham and some of her students served as “elders” guiding the game and often interacted with the students as they played. 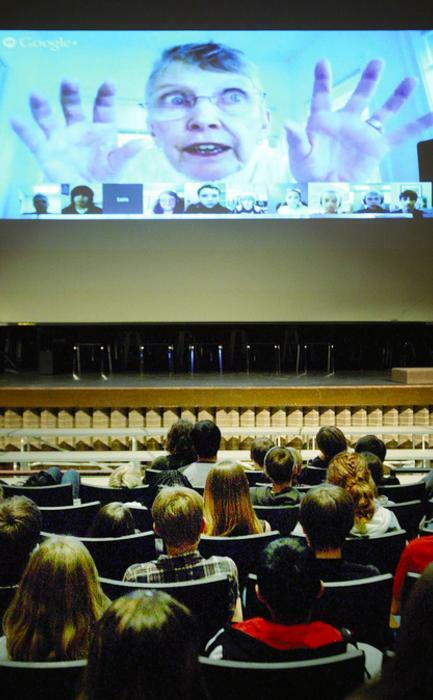 Durant teaches literature to all 61 eighth-graders at Marshall, and she said she could have chosen any of a number of them to be the school’s representative in the webinar. She picked Gabriel, in part, because he turned in his work ahead of schedule. The webinar lasted 45 minutes, a quarter-hour longer than scheduled. But technical difficulties made for a slow start, and students at some venues never got to talk to Lowry. Gabriel did, though, explaining to Lowry how he used the game to create his version of scenes from her dystopian novel. As he spoke, screen shots of his work were shown. The author, who is in her 70s, seemed amazed herself at how her 1993 book had merged with a video game. Lowry’s participation impressed Marshall School eighth-grader Milly Timm. “It was amazing because she’s one of the authors that I look up to, and it was really cool that she took time out of her day to talk to us,” Milly said of the event. Minecraft, which allows players to build their own three-dimensional world, was a different matter. She had been familiar with it only by watching her brothers play the game, Milly said. “It really challenged me to think of how I viewed the world in my head and not just reading the book,” she said. Students had the opportunity to write down questions to be submitted to Lowry as the event proceeded, however time ran out before that could happen. But Marshall School eighth-grader Gabriela Batinich said someone else asked the question she had in mind: Why, in the movie version of “The Giver” that came out this year, were adult actors used instead of the 12-year-olds in the book? Lowry explained that labor laws limit the amount of time young actors can be on screen, and that would have slowed the production. Durant, who learned the video game herself as she participated with her students, said the activity pushed her students to learn the material in a different and challenging way.